Dimensions: 18.7" x 14.2" x 14.75"
If you are a hobbyist or you've just started a small craft shop, the California Air Tools 2010A Compressor is a device you need. With it, you'll be able to accomplish a number of tasks and challenges for your projects. Just like any other product from California Air Tools, this air compressor offers practical functionality with excellent performance. To design and manufacture their compressors, the company closely follows the market trends and customer requirements. With that in mind, the company's specialists constantly work to develop new products and to improve their technologies so that every customer could find the right compressor for their application. California Air Tools compressors from Ultra-Quiet series are oil-free. Which means you won't have any issues with changing, disposablility, or refilling of oil. Moreover, there will be no oil in the air to damage sensitive items. Another advantage of oilless California Air Tools compressors is in the possibility to use them on uneven surfaces and even in cold temperatures. Due to the extra large dual pistons allowing for faster displacement of air, compressors feature reduced fill and recovery times. Considering this, Ultra-Quiet compressors can easily handle continuous use. 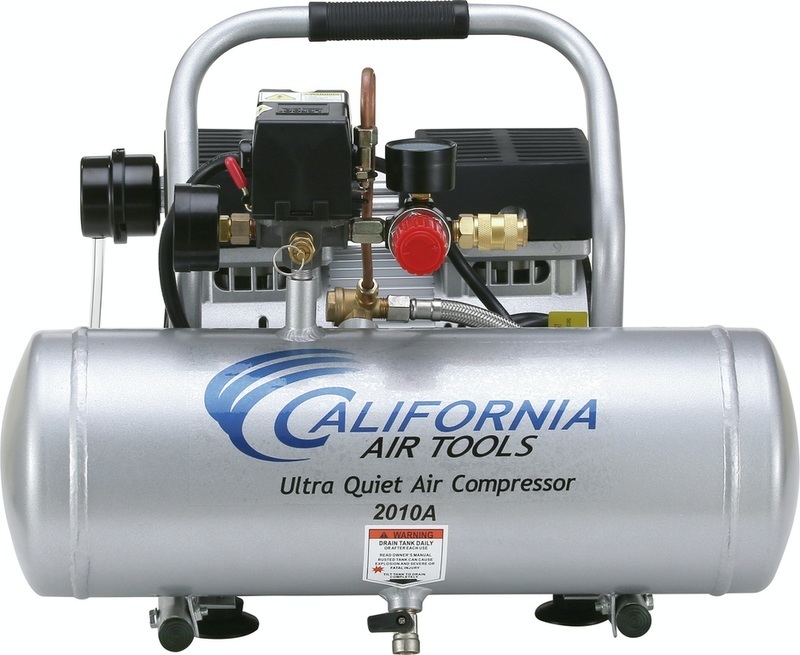 Using cast aluminum cylinders, California Air Tools has provided a longer life for their compressors. Besides, Teflon cylinder rings in the compressors create less friction resulting in less wear. To increase an output of compressors and make them produce more CFM, the manufacturer has developed a dual valve plate design. What's more, reed valves are made of stainless steel so as to ensure even more durability and rust resistance for their air compressors. Also, for less wear and a longer lifetime, California Air Tools uses brushless motors in the manufacturing of compressors. Furthermore, each Ultra-Quiet unit has 4 pole motors which operate at only 1680 RPM, thus creating less vibration and producing less noise. Beyond that, Ultra-Quiet compressors require less electricity and start easier due to the low amp draw. In addition to all that, a thermal overload protector feature reduces damage to compressor motors and prevents overheating. For the ease of air tank draining, Ultra-Quiet compressors come equipped with easy drain ball valves. Aside from the ultra-quiet operation without oil lubrication, this air compressor model stands out for its lightweight what makes it easy to transport. With 2.0 Gallon air tank and only 34 lbs weight, this will be an ideal compressed air solution for airbrush artists working in multiple locations where a noise level can be an issue. 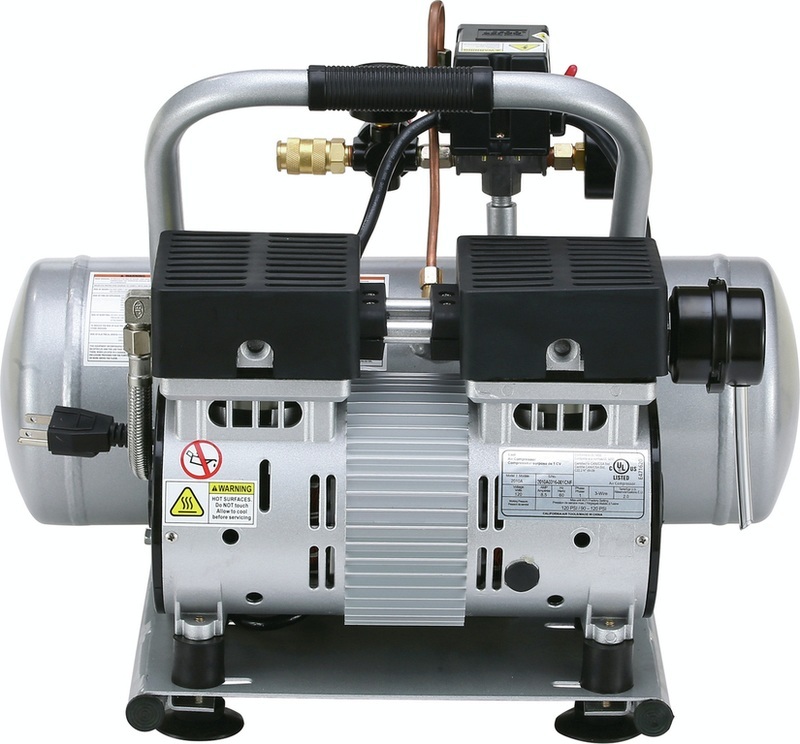 Dimensions: L 18.7" x W/D14.2" x H 14.75"
The California Air Tools 2010A Compressor includes a 1-year warranty that starts from the date of retail purchase. This provides a free repair and replacement of defective compressor parts by the manufacturer. However, first parts must be proven to be defective by the authorized service center of California Air Tools Inc.
18.7" x 14.2" x 13.5"